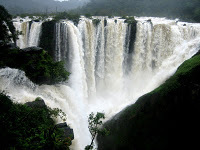 about 250 meters in one stroke, an unusual thing with the rest of falls that cascade. Guess what this portion of the Jog Falls earned the right nick name – Raja , the King. 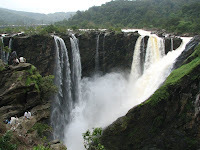 The second point that adds to the beauty of Jog Falls is the shear volume of water that plunges down the gorge. A dam called Linganmakki , constructed about 6 kilometers upstream has restricted the flow of water. However during the monsoon season, the dam opens more water down the fall. 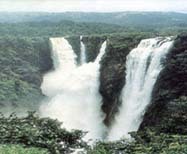 Around Jog Falls, there is also plenty of wildlife, yet only wildlife enthusiasts can venture into the jungles to have a glimpse of it. There are some decent accommodation options but Jog is a very small town and facilities are not up to the mark. Sagar and Shimoga nearby are bigger towns.